Without shells, scales and bones, the Octopus is a popular source of meat, due to the ease it can be eaten and digested. To survive in a world its exposed protein-rich body is most coveted, it needs good defense capabilities. Ninjas are known to be supreme master of stealth, reputed to vanish in a puff of smoke. Ninjas' missions are covert. If they are seen, they must immediately get away. 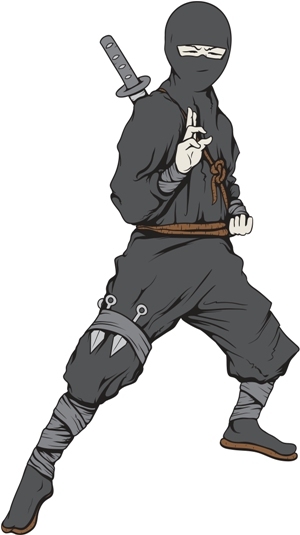 A Ninja's escape strategy is to throw smoke bombs at the ground that instantly go off, yielding a dense cloud of smoke that acts as a visual screen and distraction to enemies. The Ninja then escapes in an unexpected direction. By the time adversaries recover from the distraction, the ninja would be gone. When well executed, the illusion of teleportation or vanishing is imprinted on opponents' minds. Wow! Octopuses will have a better chance of escaping hungry, menacing flesh eaters if they master this cool Ninja trick, wouldn't they? The Octopus is master of a escape strategy that works like the Ninja smoke bomb. Pretty far fetched, isn't it? Especially in water. The Octopus can't use smoke in water. What it has improvised is an underwater 'smoke screen'. 'Holy smoke!' was probably my exclamation the first time I saw an octopus did that. What's yours? The 'smoke' comes from a dark ink fluid from Octopuses' internal ink sacs. Octopuses squirt this ink with a jet of water and are able to direct the squirt. The result is a brown or black ink cloud. When threatened, an Octopus's first reaction is usually to release ink as seen in the videos. The Octopus's next move is to escape in another direction, exactly what Ninjas do! The Octopus's ink cloud is used as a visual screen and a distraction to predators. Momentarily at least, the focus is on the 'smoke'. That is what I find myself looking at, all the time, before I let my eyes wander to search for the Octopus. It really is brilliant! There is also this enzyme, Tyrosinase, in the ink that has the effect of irritating predators' eyes and paralyzing their sense of smell temporarily. Everything about this Octopus defense ability is amazing. How did animals like Octopuses evolved to develop ink sacs in their bodies? Ink clouds look and function so much like smoke clouds from smoke bombs. Coincidence? It's mind blowing. It is not just the ability to squirt ink. There is strategy involved in its use. The same strategy devised by Ninjas. Here we are comparing Human professionals to Octopuses. 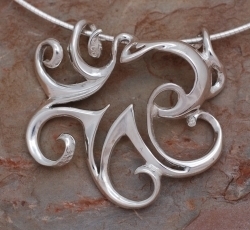 If so, have a look at our lovely silver octopus necklace collection!